A comprehensive comparative trial is underway at Northumbria Police of the Vauxhall Astra as a beat car following delivery of 56 supplied to full police specification. The Astra is one of two models currently listed within the Police National Framework for the beat car role. A key part of the trial is the replacement of the entire fleet of beat cars in two of the Force’s six area commands. This should result in more accurate feedback from officers using the cars as it will remove any element of preference for the Astra or the competitor model against which it is being evaluated. Force Fleet Manager Keith Wilson says that the exercise will not only test the reaction of officers to Astra, but look at aspects of reliability in the demanding beat car role, servicing and repair in the Force workshops, and the performance of key items of equipment fitted to the vehicles, some of which is new to the Force. The Astras are a mixture of hatchback and estate models. Forty eight are hatchbacks with 1.3 CDTi engines, whilst eight are 1.7 CDTi estates – the latter chosen for the additional space they provide needed to carry Taser equipment. They are the first Vauxhall products to join Northumbria’s 1,100 vehicle fleet in significant numbers for many years. A dramatic reduction in delivery lead times has also resulted from choosing the Astra. Previously the Force would expect the time from placing an order to delivery to be around six months, but this has been cut to just six weeks by the conversion of the Astras to full police specification by GM UK Special Vehicles at their Millbrook base in Bedfordshire. The Astras were delivered to Northumbria Police in a complete finished condition that includes Battenberg stripes, a siren, LED flashing lightbar, an incident data recorder, wiring and aerial for the radio equipment, tax and first registration. All that remained for the Force to do was fit the radio, put its corresponding call sign onto the vehicle roof, and to apply the Force crest. Keith Wilson, Fleet Manager for Northumbria Police, said that it couldn’t have been more straightforward. "We were delighted to see that the standard specification for the Astra mirrored our own; a perfect match that allowed Millbrook to supply exactly what we require but as a factory produced, one-stop product. A major benefit of a turnkey arrangement like this is that with these Astras everything is properly designed and fitted into the vehicle. There are no bolted on bits, nothing to obstruct the dash, and all the controls and switches are sensibly placed for ease of access or sight. Nothing sticks out, gets in the way or looks out of place. "We’ll be running them for four years during which time they’ll each clock up an average of 100,000 miles. So we’ve chosen to take an extended warranty from Vauxhall to cover the cars for their full four year lifetime. As Vauxhall treats everything they fit to the vehicle as original equipment we get cover for all those additional items fitted at Millbrook to our specification." Among items being evaluated is GM’s own roof-mounted flashing light bar. Up to now Northumbria Police have used standard ‘cone’ type emergency lights on their vehicles. Another item under test is a different type of aerial that is less obtrusive and therefore should prove less prone to accidental or malicious damage. 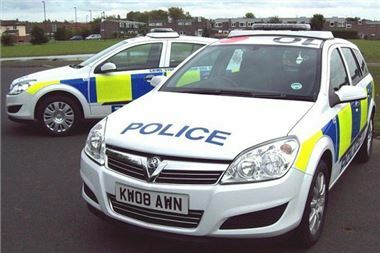 Unique amongst UK police forces, Northumbria Police also fits special protective windscreens and door glass to its vehicles. A new type will be fitted to the Astras and if this proves successful then future fitment of this glass may be carried out at Millbrook. Opened just over a year ago, the GM UK Special Vehicles centre converts standard production models to meet a wide range of emergency vehicle needs, particularly for police work. So far over 1,000 vehicles have been converted at the centre ranging from Astra beat cars to Vectra high speed pursuit cars.